Huntington Beach, California-based MJC Engineering has developed a new hydraulic power system, termed Green Hydraulic Power®. This system provides higher machine yield, reduces noise emissions by 20 dBA, generates less heat, produces a shorter cycle time on various machine types and involves less oil volume, all resulting in a system that saves up to 70 percent in energy costs to reduce the user's carbon footprint, according to the manufacturer. At this year's FABTECH in Las Vegas, the company will now offer the unit for OEM integration by other machine builders, in addition to displaying its range of metal forming machinery. MJC is a major supplier to automotive, aerospace and the wheel industry. 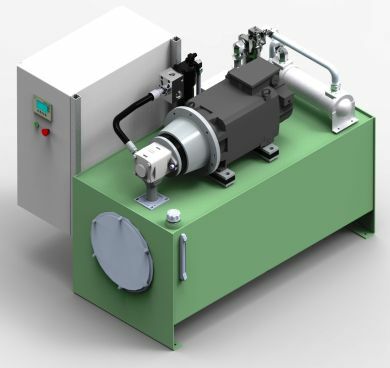 Green Hydraulic Power® is offered as standard on the hydraulic power units provided on MJC machine builds and utilizes the unique Siemens SINAMICS variable speed servo pump drive. High-demand hydraulic systems on many machine types significantly improve, as the result of using this concept from MJC Engineering, according to company President Carl Lorentzen. 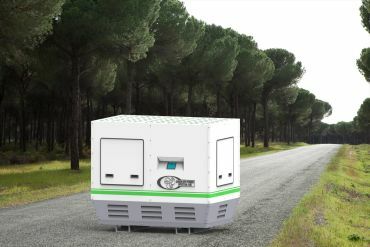 "We saw that the servo pump could control pressure and flow, as they precisely convert electric energy into hydraulic power. In some cases, the use of control valves is partially or completely eliminated, depending on the application. We quickly realized our development could be utilized on many other types of machinery as an OEM component." The applications are many for this new system concept, according to Lorentzen, as almost all machine tools using hydraulic power and are thus candidates for variable speed servo pump drive technology. Injection presses, materials handling equipment, stamping presses, other metal forming machines and more can utilize Green Hydraulic Power®, according to Lorentzen. "We're finding new applications, almost every day now." Complete payback on the system is estimated at 12-24 months and the system has the additional benefit of control data output from the onboard diagnostic capability in the drive that supplies information for a predictive maintenance protocol in an Industry 4.0 scenario. The basics of pressure, temperature and acceleration data measurement are standard, with additional data outputs on oil level, filter condition, running efficiency and other parameters available. The servo pump results in as much as a 70 percent reduction in onsite servicing, according to the manufacturer.